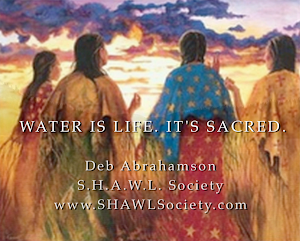 In Water Is Life - It's Sacred, Deb Abrahamson speaks about her life work - the restoration of Spokane Tribal lands, water and society. She speaks of the abundance before the dams, uranium mining, boarding schools and forces of genocide. Deb founded the SHAWL Society to right these wrongs and build on the strengths of traditional life ways. This film is available free for public access TV stations to download and broadcast from PEGMedia.org . Phone your local public access station and ask them to download and broadcast this film for your community to see. This was the most beautiful movie I've seen in a long time. I have shown it on our Peg Channel (Lake County PEG TV) in Clearlake, California where many have appreciated your message. Thank you. The 5 minute trailer will be on its way after a while.